Oooh it feels so nice to not have to hide this pregnancy away any more. I admit I am enjoying the fuss right now too, other mums on the school run offering congratulations, asking questions, saying they had suspected for a while, and so on. It'll go back to normal in a few days so I'll make the most of it for now! Things are starting to feel more normal now. I'm sick less and less often, although I was sick again this morning, and I'm not falling sleep so early in the evening any more. The Second Trimester is just round the corner and I'm hoping the worst of it is behind me now. My appetite is getting back to normal too. All though First Tri I have been unable to stick to my dietary plans. It hasn't helped that it's been so bloomin cold! But salad vegetables for my lunch just has not been an appetizing option at all since Christmas. I've tried, but they seemed bland to start with, then they actually made me feel ill. I am assuming my body knows what it's doing so I have followed it's lead and stuck to fruit through the day and plenty of steamed veg with my dinner at night. One thing I have been glad of though, is my relative disinterest in chocolate and sweets. Maybe it's because I've been substituting my coffee drinking with fruit juice and the odd (low cal, made with water not milk) hot chocolate so I've been getting my sweet tooth fix through better choices. But I even go days at a time without the hot chocolate. I have been eating pickles though. How stereotypical! 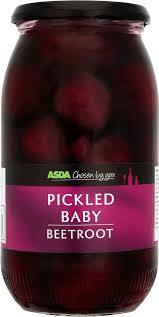 Early in First Tri I went through a phase of eating picked beetroot (0 pro points! ), then it moved onto pickled eggs. Now I'm trying to satisfy myself with Heinz Sandwich Spread which has a pickle tang to it. And I want carbs all the time! This isn't good for my GD risk. I'm not sure what to do about it. Before getting preg I was taking Kelp supplements (packed with iodine and with the added bonus of curbing carb cravings). I keep meaning to ask my midwife if they are safe for me to take in preg but haven't mentioned it yet. I also keep meaning to get on the scales and see how much weight I have gained - given how much carb I have been eating I'm sure it will be more that the 1-2lb expected in First Tri, but I have been putting it off. This coming Sunday I will be 13 weeks and officially into my Second Trimester. I think that should be a compulsory weigh day for me! My theory is that now the sickness of First Tri is passing I will stand a better chance of eating a healthy diet for the next stage of my pregnancy. I know full well that by 3rd Tri I wont feel like eating much at all!